Pamper yourself with premium amenities while staying in lavish condo: swimming pools, sauna, steam room, Jacuzzis, a gym with top-of-the-line equipment, room service, tennis court, practice putting green, 24hr security, secure parking, on-site concierge service, barbecue areas, beach clubs, fine dining restaurant, and Palapa Bar & Grill bar. 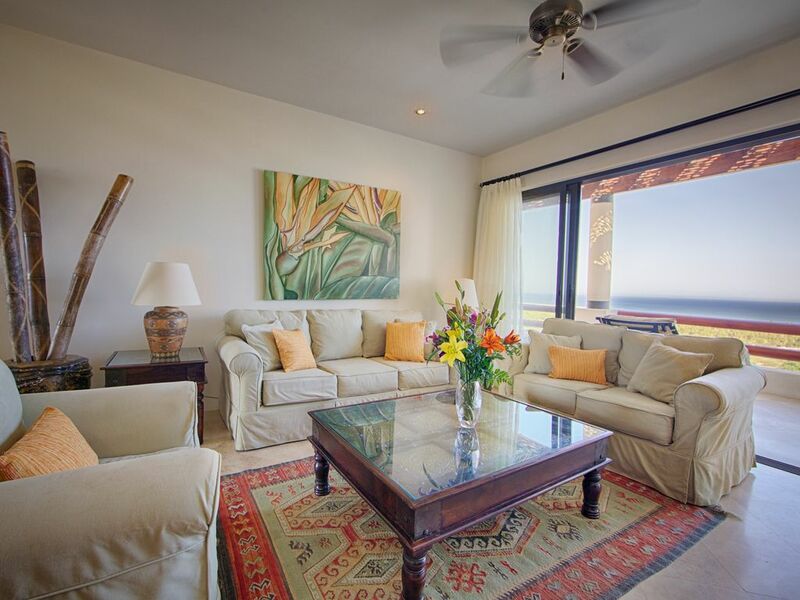 Alegranza Luxury Resort reigns supreme in the San Jose Bay area and offers you mesmerizing views of the Sea of Cortez, golf fairways, desert, and estuary. The resort is noted for its luxury to quality finishes, great service, high-end amenities, and prime location. It is within walking distance to the beach, downtown San Jose del Cabo where you will find excellent shopping and great restaurants, a new marina, and eleven 7 Top golf courses. We have a property management team on-site that will go above and beyond to ensure that your stay is a pleasant one, providing services when needed (plumbers, electricians, maids, etc...). Rates not included taxes. For monthly rates an extra charge for utilities will apply. Unobstructed views of the San Jose Bay. Secondary views of Golf Course. From your kitchen window you'll admire the 'Sierra de la Laguna' mountains and the 'Picacho' mountain (10,000 ft above sea level. You can admire the San Jose Estuary where it joins the ocean. You can rent it. Ideal for storage kayaks, bycicles, etc. Granite counter tops and GE appliances. 470 sq ft of outdoor living with expansive views of the San Jose Bay. Elevators and ground floor units are available upon request. Men and women's sauna available at no extra cost, located inside the gym. 3 saline water pools, heated in the winter for everybody's enjoyment. Long awaited getaway with my 4 friends. We were looking for a relaxing, well maintained, updated and safe accommodation for our getaway and Alegranza checked all of our boxes. During our stay we enjoyed a beautiful condo, well furnished, poolside service, in room spa services and most importantly friendly staff. We will definitely be back!!! The condo itself was beautifully furnished with high-end finishes and all the comforts of home--with some extras! Especially large master bedroom/bath, with waterfall shower head and lots of closet space. The gas grill on the balcony was perfect for our one dinner in- making fresh shrimp kebobs. It was also perfect for watching the sunrise over the Sea of Cortez. The staff welcomed us with salsa and chips and were very helpful throughout our stay. Grounds were impeccably kept, and featured three beautiful freshwater pools and two hot tubs--one super hot, and one slightly less hot but still hot and soothing. Restaurant on premises is excellent, and beach, San Jose and grocery shopping all close by. Wi-fi and television reception were perfect--no problems at all. I felt lucky to have found this place, and some of the pictures don't do it justice. Tennis court has been redone from the photos I saw, and work-out room is nice and well equipped. It was nicer than we imagined--always a good thing. We also felt very safe--Alegranza is at the top of the hill in San Jose, there is a gate and person there 24/7. There is an office and someone to help with activities, directions or questions. Alegranza consists of buildings A-F, I think 5 stories tall, to give an idea as to size. Before we left, I was not sure whether Alegranza was just a condo complex, or a resort. I now would say it provides the luxury and roominess of a condo, with all the amenities we want from a resort. We were there as a family and loved it. I spent a week at the Alegranza while I was participating in a yoga workshop. The unit was wonderful. Clean, nicely furnished, with a fully working kitchen and a large patio. I felt like I was at home the entire time. The pools are wonderful; clean, clear and refreshing after lying in the sun. Its within walking distance to beach and groceries, so its easy to pick up food to prepare in the kitchen. I would definitely return and recommend the Alegranza! We enjoyed the views from the balcony. Very good location with short walks to the beach or town, with several good places to eat nearby. The restaurant onsite is very good as well. Nice size condo with plenty of room, nicely landscaped with two pools. Very friendly and helpful staff. My family and I spent a week at Allegranza after Christmas and into the new year. We cannot say enough about the unit---it was beautiful, clean, well-equipped and quiet. Oh, and the view was amazing!! The staff was kind and helpful. We walked everywhere---the beach, the grocery store and into San Jose del Cabo many times. We particularly loved the huge deck where we read and played games and just watched the ocean and sky. Glad you enjooyed your stay! We look forward to see you in this piece of paradise soon! Beautiful condo, best view in San Jose and a wonderful staff. We stayed in a three bedroom condo for nine days. The condo was beautiful, the view was fabulous and the staff went out of their way to make us comfortable and meet our every need. The property manager Javier went out of his way to make sure we found the best restaurants and beaches. Everyone at this property was friendly and helpful in every way! We will definitely be back. Fishing, golfing, and whale watching: Alegranza is 5 min away from the New Marina at Puerto Los Cabos, where best bill fishing in the world is found. It is also located from 2 to 20 minutes away from 12 Golf Courses (4 of them ranked between the top 50 golf courses in the world). Whale watching form Dec to March is also highly recommended. Weather: The nicest of Los Cabos is its weather: dry and sunny 360 days a year guaranteed....no humidity!!!!!! Snorkeling : Los Cabos is one hour away form the second largest reef in the pacific after Hawaii....you won't believe the amount of species, colors and coral reefs you'll see on this Ocean. Couseau said that Mar de Cortes is the biggest and largest Aquarium in the world. Kite surfing, Stand Up Paddle, Sky diving and more!